The figure used for this unit is a Heroclix figure from The Flash set. Its model number and name are #001a / The Flash. 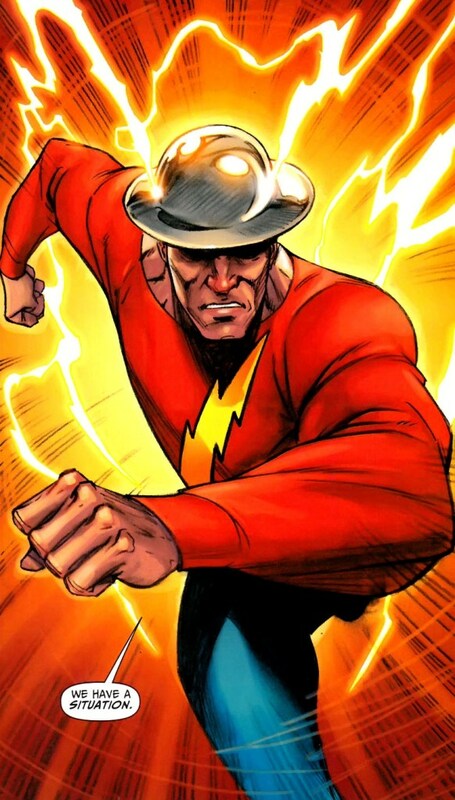 Character Bio - Turned into a speedster by an experiment gone wrong, Jason Peter “Jay” Garrick was the first superhero to use the name the Flash, becoming the lightning fast protector of Keystone City. During World War II, Jay, along with six other heroes, banded together to form the Justice Society of America. Years later, after a multiversal crisis that merged the multiple versions of Earth, Jay met Barry Allen, the Flash from Earth One. Jay came out of retirement much later to reform the Justice Society of America along with fellow members Ted Grant and Alan Scott, with the goal of training a new generation of superheroes who could carry on fighting for truth and justice. As a Metahuman, Flash has these Metahuman Synergies. As a Mystery Man, Flash has these Mystery Man Synergies. Mystery Men, Protégés, and figures with the Superspeed or Speed Force special powers may be boosted by Flash's Inspiring Speedster special power. Current Mystery Men, Protégés, figures with the Superspeed special power, and figures with the Speed Force special power. As a figure with the Superspeed special power, Flash cannot be affected by aspects of Professor Zoom's Negative Speed Force Special Attack. Flash may move through all figures, never takes leaving engagement attacks, and does not have to stop his movement when entering water spaces. After taking a turn with Flash, if he did not use his Disorienting Whirlwind special power this turn, he may move up to an additional 4 spaces. - if the chosen figures are in the same army, move up to 1 unrevealed Order Marker from each chosen figure's Army Card to the other chosen figure's Army Card. Figures moved by Disorienting Whirlwind never take any leaving engagement attacks. All Mystery Men, Protégés, and figures with the Superspeed or Speed Force special power you control that are within 6 clear sight spaces of Flash add 1 to their Defense numbers. - Disarming Whirlwind to Disorienting Whirlwind (10/31/2015). - Wording for Disorienting Whirlwind updated for clarity (11/1/2015). - Wording for Disorienting Whirlwind updated for clarity (11/4/2015). - Range on Inspiring Speedster bumped from 4 to 6 (11/11/2015). - Disorienting Whirlwind changed to affect only 2 figures, a choose between 2 effects, and 20-sided die roll removed (11/11/2015). - Cost dropped to 220. (12/9/2015). Flash may move through all figures, never takes leaving engagement attacks, and does not have to stop his movement when entering water spaces. After taking a turn with Flash, if Flash did not use his Disarming Whirlwind special power this turn, Flash may move up to an additional 4 spaces. After moving and instead of attacking with Flash, you may choose up to 3 figures Flash moved through this turn. One at a time, roll the 20-sided die for each chosen figure. If you roll a 12 or higher, remove 1 Order Marker at random from that figure’s card. All Mystery Men, Protégés, and figures with the Superspeed or Speed Force special powers you control that are within 4 clear sight spaces of Flash add 1 to their Defense number. Last edited by Viegon; April 6th, 2016 at 08:34 AM. When attacking with Flash’s normal attack, you may subtract 1 from his attack number to add 2 to his range number. I had contemplated just dropping Disarming Whirlwind and going with a 2-power card, but that leaves Superspeed without a limitation power. I guess we could switch Superspeed to Speed Force to get around that. I actually like Disarming Whirlwind. It has nice theme that we haven't previously expressed on a speedster and that I've seen Jay actually do in the comics a lot more than I've seen him throw his hat. The hat throw is cool and all, but I like Disarming Whirlwind better. My only concern with Disarming Whirlwind is it's the type of power that gets competitively abusive, especially when you get in a situation with Jay where you're taking multiple turns per Order Marker, thanks to some hub figure. So I'd want to see the D20 upped to 15+ or so if we kept it. Alternately, the same theme and a D20 power could be use to subtract from that figure's defense until the end of this player's turn, which would be fun and help him on team ups, but wouldn't be as abusive. I like the name for Inspiring Speedster just fine, but I'm a tad iffy on the mechanics. What's the theme behind him inspiring folks to defend themselves harder? Wouldn't he inspire them to run faster? (Thus a +1 to Move?). I'll echo Bats - concerned with Disarming Whirlwind being abused but like the concept, a bit iffy on the execution of Inspiring Speedster, which feels a bit cookie-cutter. I can't think of any good alternatives, though, so I'll ruminate on it. The disarming whirlwind is an interesting power, it's just way too powerful as currently written. With 3 rolls on 3 different figures, he could end an opponents entire turn on OM1. If you scaled it back I think it could be a pretty nifty power. After moving and before attacking with Flash, you may choose one figure Flash moved through this turn and roll the 20-sided die for the chosen figure. If you roll a 14 or higher, remove 1 Order Marker at random from that figure’s card. I thought it was pretty cool when Jay taught Barry how to throw lightening in the TV show. I don't know if that is something ever done in the comics or not but I think it would be cool if he had a Thrown Lightening SA. Figures on a water space attacked by this special attack roll 2 fewer defense die when defending. When a figure with the Electrically Charged Special Power is attacked with this special attack, they receive no damage and may instead remove one wound marker for each shield rolled while defending. Maybe rearrange OMs on figures he moves through instead of removing OMs? Then you can keep the roll low. That's a cool idea... spinning people around and confusing the battle is a different theme, but still an appropriate one, I think. Well, if you guys like it, I'm in for exploring it farther; like I said, I like the theme I just don't like the current mechanics. I had thought about doing a defense subtract power like that, I do think it'd be fun. Well, inspirational powers are almost always stat boosts in C3G (Cap, Solovar, Skrull Warriors, etc.). Thematically, I don't like the idea of an attack boost for Jay (he's just not very aggressive), which leaves us with boosting Move or Defense; but mechanically, boosting Move just wouldn't be very useful, considering half the units he boosts are speedsters. Plus I really like how a defense boost will work with both the JSA and the speedsters. As to the theme of boosting defense, for me, I see it as these figures being mostly heroes he's helped train or raise, and Jay (being a non-aggressive fighter) would naturally train people to focus on defending themselves and finding peaceful solutions. Ooh, I actually really like that version. Simple, but the tension between Disarming Whirlwind and the extra move from Superspeed should be interesting. I've never read anything where Jay (or any of the speedsters for that matter) have thrown lightning. I think it's a cool idea, but I don't think it's iconic enough for Jay's card. I like the idea, but I don't think it'd be all that useful. Also seems to loose the theme a little. After moving and instead of attacking with Flash, you may choose up to 3 Unique Heroes Flash moved through this turn. One at a time, roll the 20-sided die for each chosen figure. If you roll a 8 or higher, until the next time you reveal an Order Marker, the chosen figures roll 2 fewer attack dice. Less annoying than removing OMs, but also less of a gamble, and still useful, as long as he's teaming up with someone. After moving and before attacking with Flash, you may choose up to 3 figures Flash moved through this turn. Roll the 20-sided die. If you roll 14 or higher, you may move 1 Order Marker from each chosen figure's Army Card to the Army Card of a different chosen figure, as long as both figures are in the same opponent's Army. I guess it could be pretty fun; it would certainly be unique. EDIT: I like that too TB, it really gets the theme I was going for. I'm a little worried of keeping track of that power, but maybe it's not too bad.